In the midst of the Supreme Court’s decision released regarding the President’s proposed Deferred Action for Parental Responsibility (DAPA) and expanded Deferred Action for Childhood Arrivals (DACA) programs, our Refugee & Immigration Ministries, Immigration Legal Counsel, and Disciples Home Missions within the Christian Church (Disciples of Christ) express our disappointment in how this decision leaves millions of immigrants in fear, and results in keeping many separated from their loved ones. Already, the journey for immigrants seeking justice and family unity has been long and grueling, and our scriptures lead us to understand that such a deferral of hope “makes the heart sick” (Proverbs 13:12). Immigrants in our Disciples faith families and throughout our neighborhoods have passionately prayed, long-awaited, and ardently worked throughout their journeys in the U.S. to follow God and to contribute to our society and congregations. Many hold leadership within our churches, serve us in our communities, and demonstrate values of immense resilience, creativity, and commitment to their families and faith. Therefore, we are saddened by how today’s decision continues to leave so many Disciples and other families comprised of mixed status or undocumented individuals feeling heartbroken and suffering. We continue to pray for a time when persons who would have been eligible for expanded DACA and DAPA can be free of the fear of deportation. We pray for their families to experience a better future where God’s promise of hope may prevail–for we believe such hope is the very heart of our Christian faith. 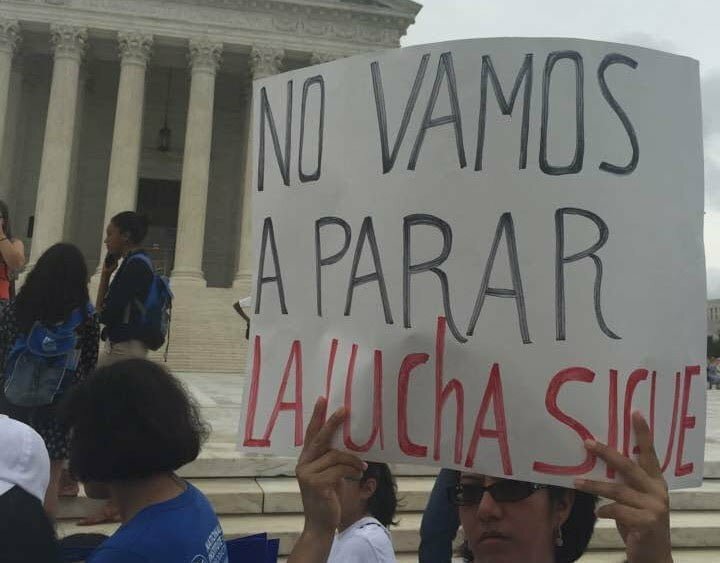 As we communicated through an Amicus Brief to the court, we join other faith voices in testifying to the abundant strengths and courage we see in our immigrant neighbors and church families. We appreciate the vital assets that immigrant skills and hard work offer towards the improvement of our nation. We celebrate the ways that the original DACA program–which recently marked its fourth anniversary–has greatly expanded educational opportunities and offered emotional and family encouragement for its 728,000 recipients in all 50 states, has produced positive financial impacts for recipients, and thus has resulted in additional tax revenue that benefits all Americans. In this time of discouragement, we call upon the power of God to uplift our immigrant brothers and sisters, knowing that throughout time God has promised to those who suffer: “I will turn their mourning into joy; I will comfort them, and give them gladness for sorrow” (Jeremiah 31:13). Together with those in pain, we promise to pray with compassion for the thousands who today still suffer in detention. We remember the children, spouses, parents, and other loved ones still separated from one another-and we will continue to seek unity for their families and due process in their cases. We offer our voice of support for those who too often feel silenced, and who experience discrimination among us. On this day, we redouble our commitment to encourage acceptance of immigrants and refugees, and to fight against any unjust criminalization of immigrants; knowing our God calls us to “not neglect to show hospitality to strangers, for by doing so some have entertained angels without knowing it” (Hebrews 13:2). And especially, we re-commit to seek God’s leading towards permanent solutions for undocumented immigrants through just reforms of our nation’s immigration system. For only then can the daily pain and uncertainties of immigrant neighbors find healing. Over the next weeks and months, Refugee & Immigration Ministries (RIM) and Disciples Legal Counsel will provide resources for individuals seeking additional information and guidance for next actions in light of the court’s decision. See www.disciplesimmigration.org/executive-action and look towww.discipleshomemissions.org/dministrative-action-information-reponses and to www.discipleshomemissions.org/dhm/refugee-immigration-ministries for ongoing news and immigration advocacy updates and opportunities. Also, contact Rev. Sharon Stanley-Rea, RIM Director for advocacy information at [email protected] and Tana Liu-Beers, Esq., Disciples Immigration Legal Counsel for legal assistance at [email protected].